Sell, back to the bench now that Oczipka has returned. BTW, any reason why Mendyl (83) is worth the same as Zeki Celik (85), despite being 2 ratings lower? He had a lot of minor injuries, so he played only 400 minutes. I would wait until the end of the season, or another 2-3 months to see how things will unfold. Ferland Mendy vs Luke Shaw? Kolasinac. He was injured in the first part of the season, expecting to play regularly. Sebastian rudy + matthias ginter or de vrij? I don't like Rudy, I could not be objective. Jovic +3 imo banging them in left right and centre for Frankfurt, 15 goals in 16 games and 3 assists. Opinions? I hope for my beast from Bijeljina! Rebic 5 goals 2 assists in the league plus WC performances enough for a plus 2 to 89? Why? Genk 1st Vukovic is a starter! I think Akanji will get 90... I know he's injured now but I think he's done enough and Dortmund are flying. oh, and where's the rise for ZIMMER!? 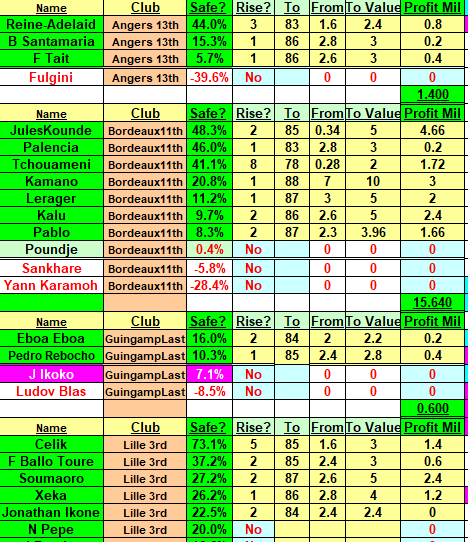 I have had to add and adapt my Spreadsheet to be able to give a picture of French Review (as you see below) and been a bit rushed in doing it, so hope the inputs (+1 instead of +5 rises etc.) I've made are all correct. Please advise if anyone sees any glaring errors. I have checked thru and can't see any obvious blunders. 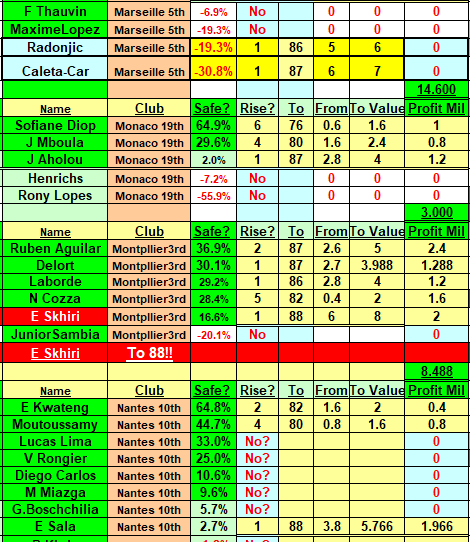 Things go badly wrong here Radonjic and Caleta Car very few minutes and injuries yet get rises, then 5 at Nantes (SM going home one night and next morning ignore Nantes and go to the next club I wonder). Pleased Sala got his! Not too bad a job at Nice but would have liked Saint to get his. would have been a nice mark-up. PSG fine as Marquinhos is a Performance rather than Minutes 92/93. 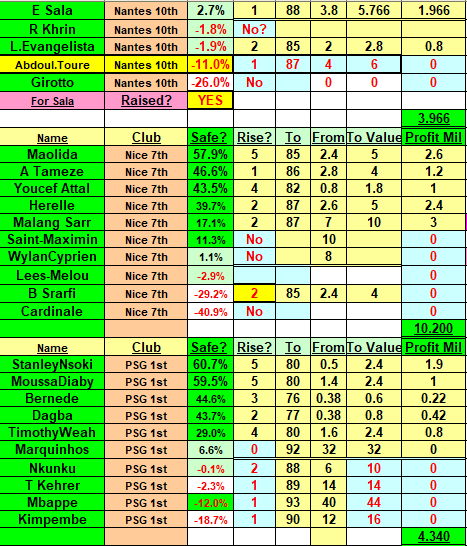 Nkunku and Kehrer show I should change the co-efficent upwards slightly for the next Summer Review but Srarfi was generous to say the least. Didn't allow the profit on Nkunku even tho he was only -0.1% and neither Mbappe even tho I have him and we all knew he was going up and not judged on minutes at all! Pleased with PSG. 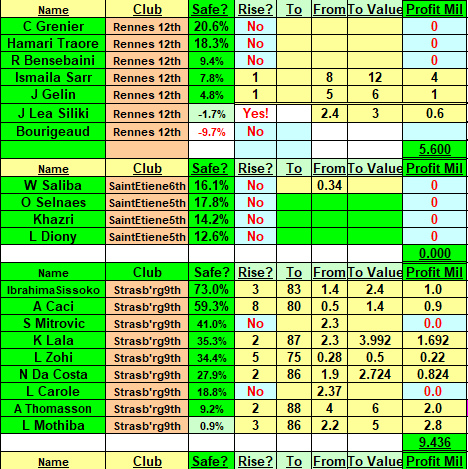 SM harsh on Rennes, largely ignore St Etienne and Mitrovic at Strasbourg. So total risers of just short of 120Million! Great Pity about Todibo but SM would say he's just been added or something equally weak. Now that a whole league is done is it possible to bring up names from German league with similar datas comparing with Ligue1 players side by side?Just a handful will do to give an idea. 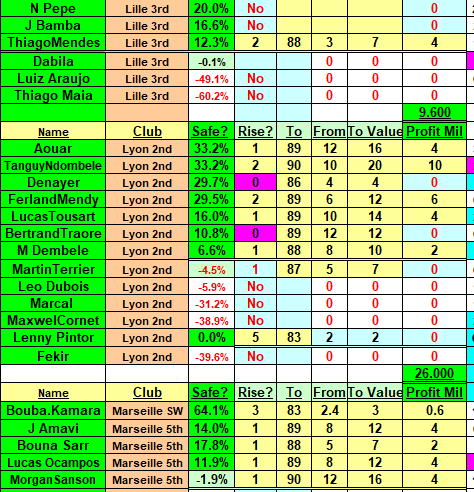 Also not big players but players like Xeka, Mendes and Laborde. Sorry MF not possible at this stage, Its such a time-consuming period during the reviews. I am well, well behind with inputting recent minutes & new players etc etc for Germany, Italy, Spain and England. Probably have to rule out anymore for Germany and move on right now. Inputting new minutes is important because Players can move from plus to minus just by missing 90minutes when minutes are as low as 990 or just over a 1000. Next review it will be more like 2070 out of 3420 which is more stable a figure. Pretty sure Chiesa will get 90 in next few weeks. Already one of best young players in Italy and in high demand. Not sure if he will be at Fiorentina come the summer..
Dont think because he didn’t go to the World Cup like plenty of other players is a reason not for him to rise. He barely played a part in qualification so hardly his fault. Reckon Barkley 90 as well, although as ou say worst case scenario end of season. World cup, agreeing or not, it gives players game time and opportunity to shine in the biggest of stages. He wasn't part of it, unfortunately didn't had the opportunity to show his skills like others youngsters had. Chiesa deserves 90 more than Barkley! just saying..
Not like it was his fault he didn't go to world cup, I'd understand had he not been selected but that's not the case. Not going to WC wasn't his fault for sure, and neither is not playing in European Club competitions. But the fact is that he hasn't done much of note since his rise to 89, a couple of goal and half dozens assists in a team that only plays in one competion, the Serie A and is struggling. There is clearly love for Chiesa here, and I don't see him play every week, but when i see him, like last weekend against Juventus, i wasn't impressed, De Sciglio put him in the pocket. What he might have to boost him a rise to 90 is Hype, because he's young, nothing else atm. how about ginter + rashford or de vrij? Yeah regardless of World Cup fully expecting the 90 for Chiesa. I guess you only read that part concerning the world cup, as you're insisting on it. But anyway, i'm not saying he will not get it, but if he does is 100% undeserved, especially comparing to other young very talented 89 players like Thorgan Hazard or Lozano for example, who are a big step above him . I'm guessing Asensio is likely to stay at his current rating for the time being? I have a feeling Duda will get +1 like Laborde. hi guys. Opinions on this deal. I wish. The deal is those 3 for the other 3. Origi +1! You heard it here first. Origi is the new "David Fairclough" and if Sky Sports hadn't already said it you'd have heard it here first. Kane and Abel and Saul and Sandy... that is a good deal! Saul, Kane and Sandro without doubt. The reason being Boateng will decrease pretty quickly and Alaba won't increase by much any time soon. Whereas, neither of Kane, Saul or Sandro will decrease. Most probably all will increase.